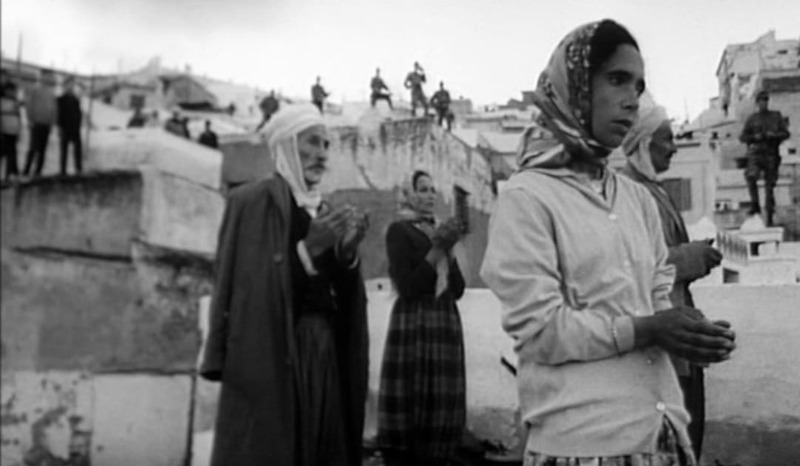 Still from 'Battle of Algiers' (1966). The Algerian revolution against French settler colonialism, which marks its 55th anniversary today, March 19th, stands as one of the most iconic victories for Third World liberation. In the furnace of the brutal, seven-year-long struggle, Franz Fanon forged The Wretched of the Earth. The Front de Libération Nationale’s (FLN), victory was remarkable not only because of the brutality of the French settler colonial project but because, although splits within the FLN certainly existed, there was a general consensus that political independence was not the end of the revolutionary process. The next stage was to transform Algerian society and reverse what the FLN understood as the economic and social backwardness caused by colonial exploitation, through a sweeping project of nationalization, centralization, and planning. The experience of Algeria’s revolution then, serves as a powerful example of both the achievements and failures of a revolutionary program put into practice with state power and massive natural resource wealth. The FLN was made up of a wide range of ideological tendencies unified by the common desire for independence from the French. However, the left wing of the party rose to prominence after the victory in the war of independence. Ahmed Ben Bella, the first president of Algeria, represented the Marxist tendency of the left wing of the FLN, which was split between his camp and that of Houari Boumediène, who espoused an ideology similar to Nasserism in its rejection of Marxian materialism and embrace of Arab nationalism. One of Ben Bella‘s first economic policies was to nationalize industrial property and codify a system of worker self-direction. In 1971 the regime nationalized 51 percent of the main French petroleum company operating in its territory and 100 percent of French natural gas concessions. Firmly in control of its petroleum resource revenue, the FLN set about implementing an ambitious development plan; to use petroleum revenue to develop an industrial economy that would be the basis for a total transformation of society. The FLN‘s state-led development was remarkably successful in achieving economic growth and raising living standards through huge investment in education and healthcare systems, which were non-existent before independence. Gross fixed capital formation was higher than the East Asian states on average during the 1970s and manufacturing-value added was growing faster than the overall economy by the mid-1980s. By that time however, low oil prices exposed the contradictions of this petroleum-financed, state-led model. The manufacturing investment which the government made in the wake of the 1973 oil embargo windfall could not buffer the economy from the decline in the price of oil. In response, the regime embarked on a process of neoliberal economic restructuring. The reforms were similar to those which were being imposed onto heavily indebted countries as a condition for receiving loans from the International Monetary Fund elsewhere in the world in the 1980s. Influenced by the neoliberal ideology; “industrial policies” were out and the market mechanism became the solution to nearly every economic problem. The sizable Algerian industrial workforce had other ideas, and led a wave of strikes culminating in the general strike of 1988, in which 98 percent of workers participated. With strikes and social unrest crippling the economy, the FLN announced that multiparty elections would be held for the first time. What follows is well known; Islamists were able to capitalize on disillusionment with the FLN’s faltering program. That the regime had no response to declining oil prices but to cut back the gains of the previous decades through drastic austerity, leaving it vulnerable to critique from the left and the right. However, the discourse of the victorious Front Islamique du Salut (FIS) did not center on a critique of state socialism from a market rationality perspective, but the Eurocentrism of the regime’s understanding of what constitutes modernity itself. For the FIS, the concepts of socialism and secularism were foreign, specifically French, imports, grafted onto Algerian society by a leadership that had internalized the contempt and hatred of the colonial masters, and opposed to an “authentic” identity centered on Islam. An internalized Eurocentrism was not peculiar to the FLN, it was very much hegemonic throughout the 20th century, underpinning the competing socialist and capitalist teleologies of the time. One of the most enduring legacies of colonialism is after all, the idea that it is impossible to contemplate a future in which the rest of the world does not resemble Europe. The process of “development” was then and still is understood by most as “the diffusion of the superior [i.e. European] model,” in the words of Egyptian economist, Samir Amin. This is a discourse which resonated because it was articulated against the backdrop of a broader shift, as the international economic and political order dominated by the binary of Euro-American Keynesianism and its Soviet state socialist challenger crumbled, taking their respective ideologies and their high modernist, teleological belief in progress through reason along with them into oblivion. The eight year civil war that resulted from the nullification of the election results left Algeria at an impasse that characterizes the Arab world to this day. The secular modernization regime, stripped of its raison d’être, can only define itself in opposition to the Islamist threat. Devoid of the real content of the social and foreign commitments constituted its mandate, regimes like the FLN, the Baath in Syria, the Egyptian military hobbled along through the neoliberal period as empty shells. Just as financialization, deregulation, and cheap labor propped up the neoliberal order in First World, debt, geopolitical rents, and the record high oil prices have done in the Third World. Within the constraints of neoliberalism, escaping the cycle of oil dependence is not only inadvisable, it is impossible; states should chase Ricardian advantage, diversification is distortionary, the heavy state intervention that industries require to become sustainable is infeasible, even if there is political will to attempt such an endeavor. 55 years after the victory against France, in the absence of the sweeping project that animated the revolution in its early days, Algeria has withered into another rentier security state, albeit with a secular veneer. 95 percent of the annual budget comes from petroleum. Its geriatric leadership responded to the Arab Spring uprisings in 2011 by increasing subsidies, doling out a bigger share of the petroleum revenue, and crushing dissent with its infamously efficient security apparatus, just as Saudi Arabia and other Gulf monarchies did. “Oil dollars may make the world go round, but they have kept Algeria still.” Six years later, discontent lingers, and sporadic protests and riots are common. In 2017, however, as in 1981, the oil bonanza has come to an end, and the hundreds of billions of dollars the generals amassed in the last decade are rapidly dwindling. The recently passed annual budget is a typical austerity budget, replete with key subsidy cuts and tax hikes. The praxis of neoliberalism has created the conditions of its own ideological collapse, which are manifest in the First World in the form of the twin shocks of Brexit and Trump’s victory. In the Arab world, these conditions opened the way for the Arab Spring uprisings. Though the Algerian regime, like the Jordanian monarchy, was able to survive the initial wave of protests unscathed, a deteriorating economic outlook in the region combined with depressed oil prices pose a huge challenge in 2017. The Algerian revolution did not die with the rightward shift of the FLN in the 1980s, it lives on in opposition.